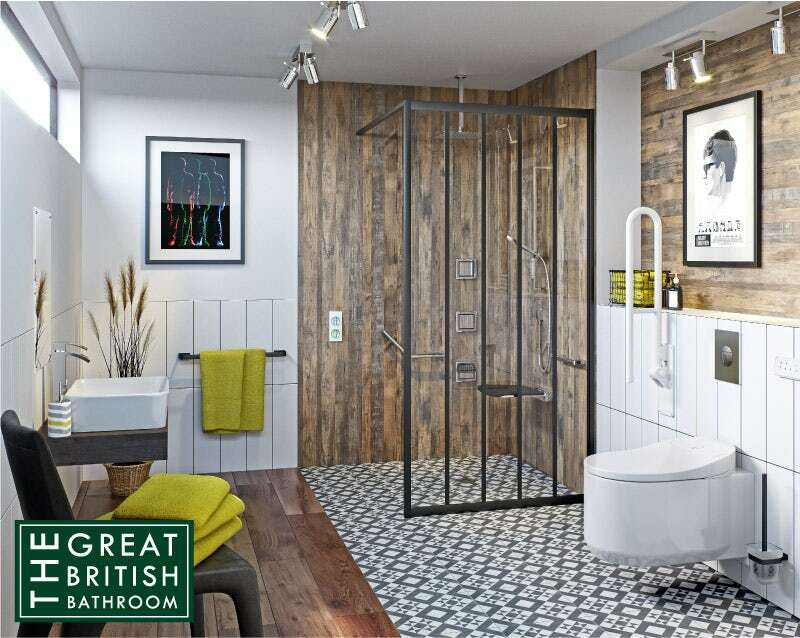 As part of our celebration of The Great British Bathroom, we’ll show you how a wheelchair-adapted bathroom can be both stylish and accessible. There are currently around 1.2 million wheelchair users in the United Kingdom, according to NHS England, with around 800,000 using their wheelchair on a regular basis. With such a significant number of wheelchair users, it’s not surprising that many families are looking for accessible design solutions which strike a balance between style and function when renovating their homes. 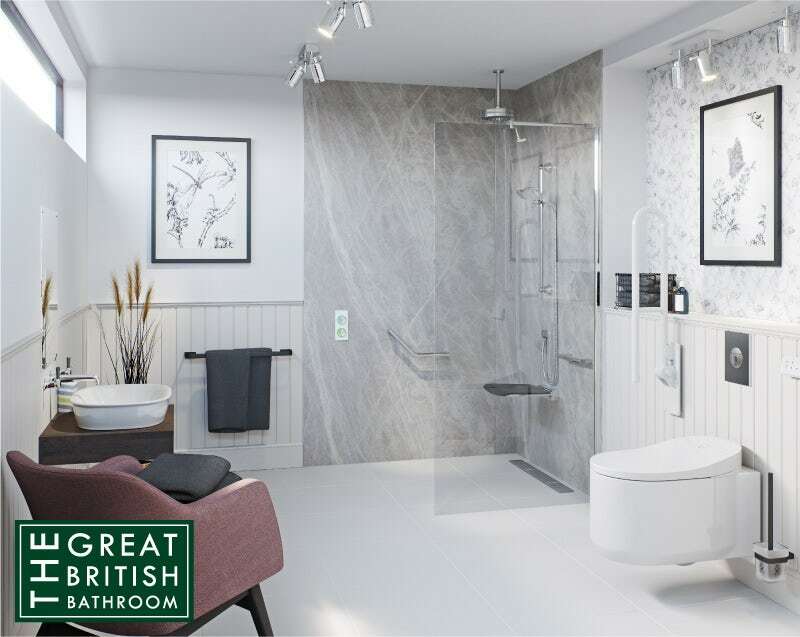 As part of our series of Independent Living bathroom guides, we’ll be looking into all the things you’ll need to consider when designing a stylish yet accessible bathroom for a wheelchair user. However, we’ll also be examining how such a bathroom can become a shared space, used by both wheelchair users and non-wheelchair users alike. Before we begin, it’s a good idea to gain an understanding of what we mean when we refer to “Independent Living”. Many, many people in the UK live with some form of disability or issue which affects their day-to-day mobility. Whilst this can vary greatly in terms of severity, in most cases certain adaptations will be required around the home to aid movement and accessibility. This is what we term “Independent Living”, as the person is still able to maintain a distinct independence through use of these adaptations. In the bathroom, the most common Independent Living products are grab rails, fold down seats and wet rooms, but there are many more products, which, when combined, can provide an excellent environment for that person’s unique needs. If you wish to discover more on this topic, read our blog post on Independent Living. We also look at the differences between Assisted Living and Independent Living. 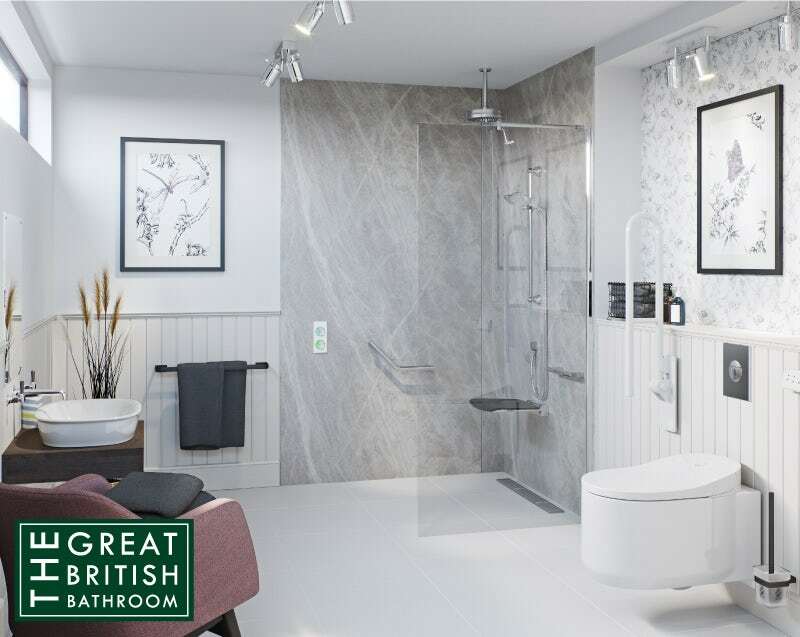 To demonstrate how to create a stylish yet functional bathroom for a wheelchair user, we’ve created 2 case studies, which follow wheelchair users in their quest to create a stylish family bathroom. This is Sarah. Sarah is in her mid-forties, a mother of two teenagers and wife to husband Jonathan. Sarah relies on a wheelchair for mobility after a car accident 7 years ago. The family live in a spacious home, however, the family bathroom hasn’t been redecorated for a long while and is looking a little tired and dated. This bathroom is shared by all four family members, so will need special adaptations for Sarah but will still need to function as a busy family bathroom. Sarah is passionate about interior design and she wants her new bathroom to reflect on-trend styles as much as possible, with any adaptations blending seamlessly into the overall design. The family are keen on new technology and they own an Amazon Alexa. There is a subtle industrial feel to the décor, something that Sarah loves as it is bang on-trend. The black-framed glass panel, wood-effect and feature tiles, combined with the choice of lighting, certainly adds to this style, whilst the colour scheme and products are highly contemporary. The family decided to create a wetroom as this would provide level access to the shower area for Sarah, whilst Jonathan and the kids don’t really take baths anyway, as they lead such busy lives. This is Nila. 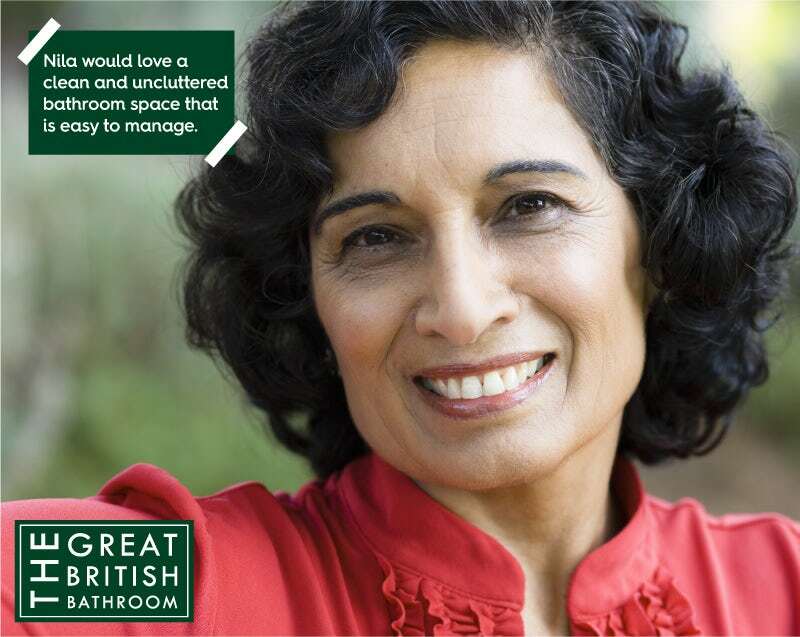 Nila is in her late fifties and lives with her husband Maneesh. Nila has been a wheelchair user for most of her life. Nila and Maneesh live in a bungalow on their own. They have a large and extended family, with grown-up children and grandchildren, who often come and visit. The bathroom, which was converted from a spare bedroom, could certainly do with a refresh and Maneesh would also like something that is easier to use now he is approaching retirement. When it comes to her home, Nila enjoys keeping up with the latest styles but also appreciates traditional elements. She would love a clean and uncluttered bathroom space that is easy to manage. Thanks to the subtle floral prints, this bathroom has a feminine edge which really appeals to Nila. However, if Maneesh wanted to make his mark on what is a shared space, the prints and wallpaper could easily be swapped for something more neutral. 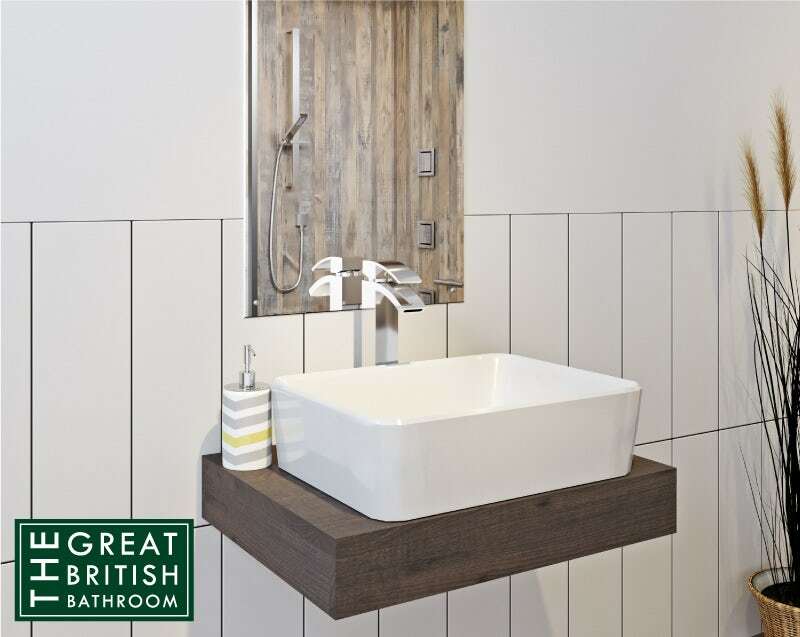 The overall colour scheme is on-trend grey, producing a clean, light and bright bathroom, with a classic rain can shower head, vintage basin and tongue and groove wall panels giving a nod to traditional style. However, the thing that Nila loves most is that it certainly doesn’t look like a bathroom that has been specially-adapted for wheelchair use. There are numerous adaptations which we will highlight next. 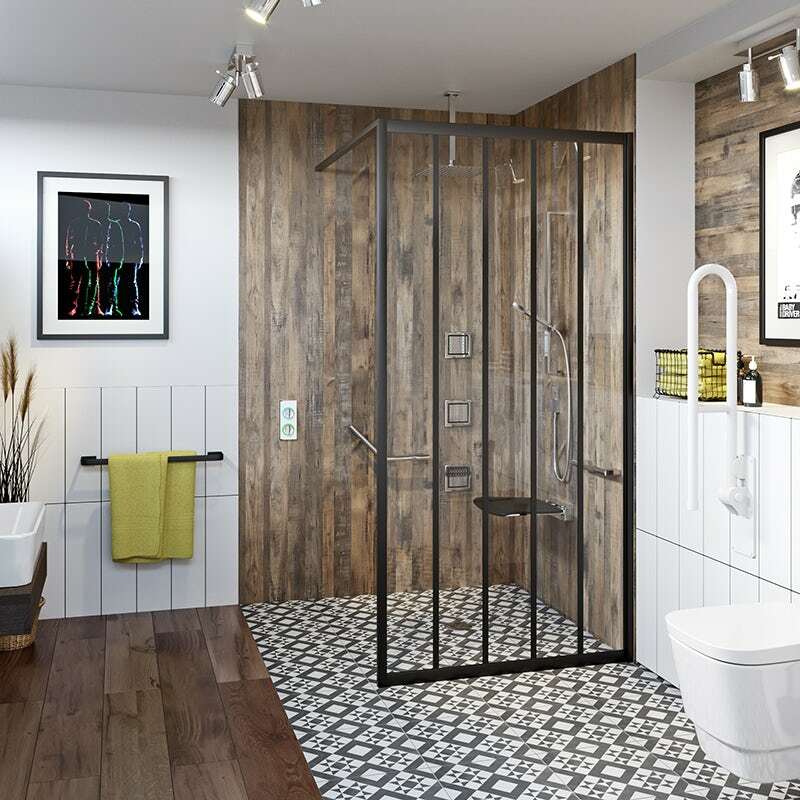 A wetroom is easier to create than you think, with wetroom kits and trays providing a simple and straightforward way to waterproof certain areas of your bathroom. By having level access throughout, both Sarah and Nila can take their wheelchairs right into the shower area and can transfer themselves to the fold down shower seat using the grab rails. One added bonus is that the seat can be folded up after use, so as not to obstruct the rest of the family. Both the seat and the glass screen feature black as an accent colour, helping to create a more industrial look and feel. Connecting seamlessly with the family’s Amazon Alexa smart home system, the SmarTap system allows Sarah, Nila and their families to programme individual shower experiences. When they want the shower to start, they simply ask Alexa to do it for them. The chosen shower comes complete with a slider rail kit which is at a height that Sarah and Nila can reach, plus an overhead shower and body jets cover all angles. 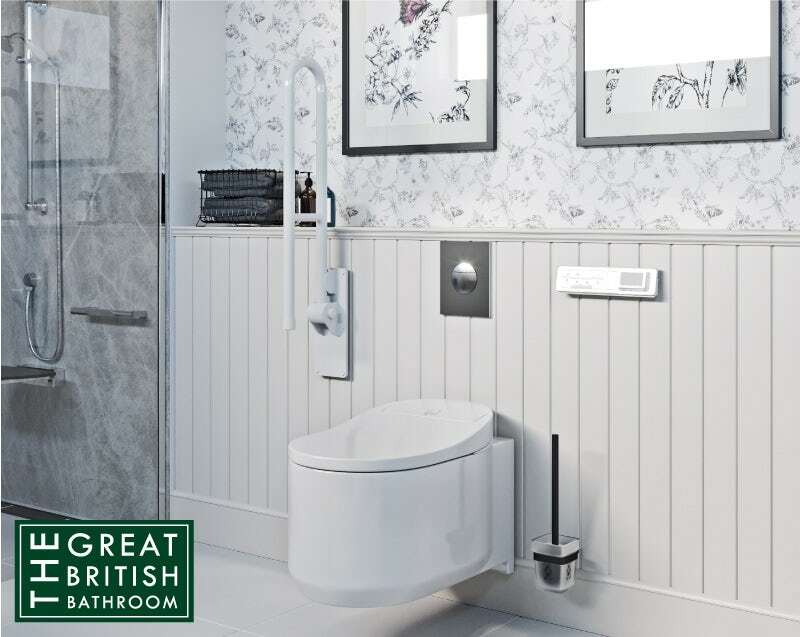 In choosing a wall hung toilet, Sarah and Nila have ensured there is no compromise on style, and by selecting the Grohe Sensia Arena smart toilet they can be assured of incredible levels of comfort and hygiene, all at the touch of a button. They can control the toilet using a remote control or even using a smartphone app, with fully adjustable, self-cleaning sprays and a warm air dryer. With a motion sensor, the lid lifts automatically for ease of use, whilst the rimless design and anti-bacterial properties make this one of the most advanced toilets available. With the cistern neatly concealed behind a false wall, the look is clean and uncluttered with no awkward areas that will require cleaning. The white tiles along this wall may seem unobtrusive but they are also a design feature, helping to blend the grab rail into the background. This grab rail also folds up after use, so it doesn’t get in the way of the other family members. A contemporary countertop basin is a stylish choice in any bathroom, however, in this one, it also serves an additional function. The dark Orion countertop basin shelf fits neatly with the industrial theme but has also been set at a height that is comfortable for a wheelchair user. With no pedestal or plumbing in the way, Sarah and Nila are free to pull their wheelchair right up to the basin, whilst their families can also use it in comfort. Height is a major consideration when it came to adding accessories to this bathroom. 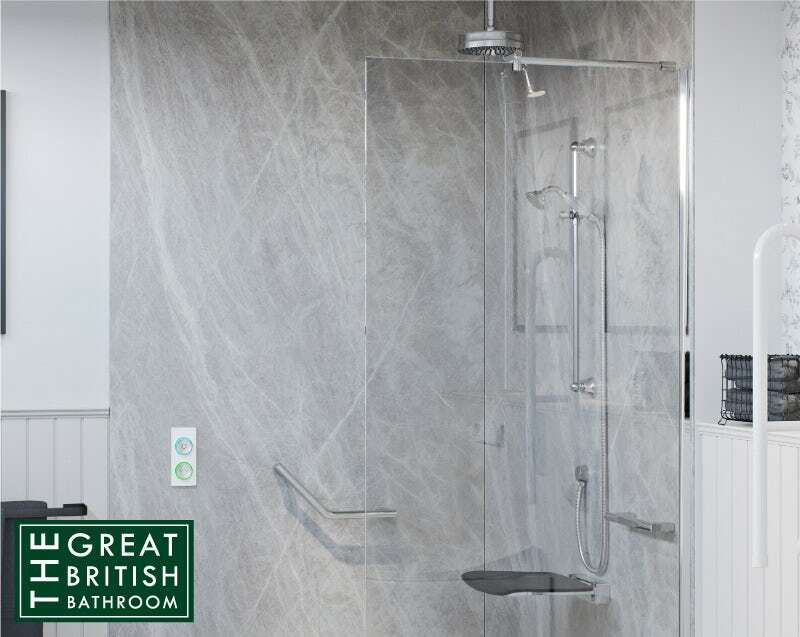 Towel rails and mirrors are set at a comfortable height for a wheelchair user, although supplementary accessories could also be added to suit the other family members. The false wall provides a handy space for storing items whilst a chair has been provided for additional storage.